You can edit a subdomain record in your DNS (Domain Name System) zone file for a domain registered with GoDaddy. Subdomains use a domain prefix, such as pics.coolexample.com to point to an IP address. To add a subdomain that points to a domain name or URL, you can add a CNAME. To edit DNS for a domain not registered with GoDaddy, you can use DNS hosting. You can watch a short animation of this task farther down the page. From the Domain Manager, select your domain name from the list to access the Domain Settings page. 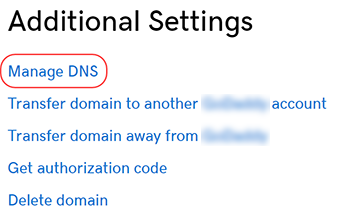 Scroll down to the Additional Settings section and select Manage DNS. On the DNS Management page, next to the record you wish to edit, click the pencil icon. • Is domain forwarding turned on? • Is the domain connected to 3rd party site (e.g., Squarespace or LinkedIn)? Visit that site to disconnect it. Host The host name, or prefix, the subdomain links to. If you enter @ for the host, this will change the IP address for your root domain. Note: All DNS changes can take 24 - 48 hours to fully update across global networks. You can add a subdomain that points to an IP address. Or you can delete a subdomain if it's no longer needed. If you need to edit DNS for a domain not registered with GoDaddy, you can manage DNS hosting.